Defense Secretary Ash Carter, left, testifies before the House Armed Services Committee on Capitol Hill in Washington, June 17, 2015. Joint Chiefs of Staff Chairman Gen. Martin Dempsey listens at right. U.S. Secretary of Defense Ash Carter told a House panel Wednesday that the most critical line of defense against Islamic State militants is in building a stronger, more inclusive Iraqi government. Carter said the U.S. is seeking a “greater commitment” from Iraq, especially in recruiting enough soldiers for training to assist in the fight against the Islamic State group. He told the House Armed Services Committee the U.S.-led air campaign against Islamic State positions in Iraq requires "capable, motivated, legitimate local ground troops to seize, clear and hold" land. Carter called last month's fall of Ramadi, the Anbar provincial capital, to Islamic State fighters "deeply disappointing." "As I've told Iraqi leaders, while the United States is open to supporting Iraq more than we already are, we must see a greater commitment from all parts of the Iraqi government," he said Wednesday. He said a lasting defeat for the Islamic State group would require local forces to fight and prevail on the ground. The U.S. role "is to be an enabler or motivator — not a substitute for a capable ground force," Carter said. "That's where we'd like to get to." Carter also told lawmakers the U.S. would not meet its goal to train 24,000 Iraqi troops by this fall. "We simply haven't received enough recruits," he said. The U.S. has only enough recruits to train about 7,000, in addition to about 2,000 counterterrorism service personnel, he said. The defense secretary said U.S.-led coalition airstrikes against the Islamic State group in Iraq and Syria had produced some clear results in limiting the militants’ freedom of movement and impeding their efforts to reinforce fighters. However, the ground campaign “is a work in progress," Carter said. The Iraq Security Forces' performance has been mixed, he added, with some units fighting "admirably and relentlessly" and others dissolving, such as in Mosul last year. Carter said other U.S. efforts to fight the Islamic State group include denying Islamist militants safe haven in the Middle East region, enhancing intelligence collection on the terrorist group, and countering the militants’ message and flow of foreign fighters into the region. Representative John Kline, a Republican from Minnesota, asked, “Are we, the United States, the free world, Western allies … winning or losing" in Iraq? 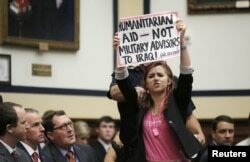 A protester holds a sign as U.S. Defense Secretary Ash Carter and U.S. Joint Chiefs Chairman General Martin Dempsey (unseen) testify before a House Armed Services Committee hearing on Capitol Hill in Washington, June 17, 2015. However, Dempsey explained a decisive victory “can only come through regional countries defeating” the militant group. He compared the Islamic group network to the 60-nation-strong U.S. coalition. “To defeat a network, we have to become a network,” he added. “We’re trying to build a network that will enable the regional stakeholders to confront this threat. … Frankly, that’s the only way it will be resolved,” Dempsey said. The top U.S. general also said he would not recommend regularly deploying small numbers of American troops to the front lines with Iraqis just to "stiffen" their spines. "If their spine is not stiffened by the threat of ISIL and their way of life, nothing we do will stiffen their spine," he said, using an acronym for the Islamic State group. The House hearing comes a week after President Barack Obama announced plans to send more U.S. forces to advise and assist Iraqi troops. The 450 troops will be based in Anbar province as part of an effort to bolster an Iraqi push to retake the provincial capital of Ramadi and other areas from the Islamic State group. The president has resisted critics' calls to add U.S. ground forces to the fight, relying instead on a campaign of more than 4,500 airstrikes against Islamic State targets in Iraq and Syria during the past 10 months. 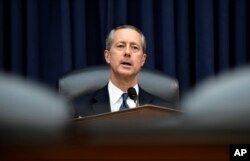 Representative Mac Thornberry, chairman of the House committee, asked Carter if the addition of 450 people would make a difference in the fight against the militants who have taken control of large swaths of Iraq and Syria. Carter countered that the number was not as important as where those personnel were located — in Sunni territory — in regards to recruiting and training Sunni fighters. The Pentagon, in its latest report of coalition airstrikes, said Wednesday that warplanes launched four strikes in Syria overnight. 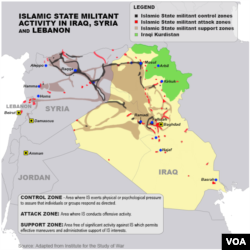 In Iraq, seven strikes were conducted around the country, focused on the area near Sinjar. Islamic State first came into the public eye there last year when its land grab forced the local Yazidi population to flee into the mountains. Jeff Seldin contributed to this report from the Pentagon. Carolyn Presutti contributed to this report from Capitol Hill. Some material for this report came from AP and Reuters.